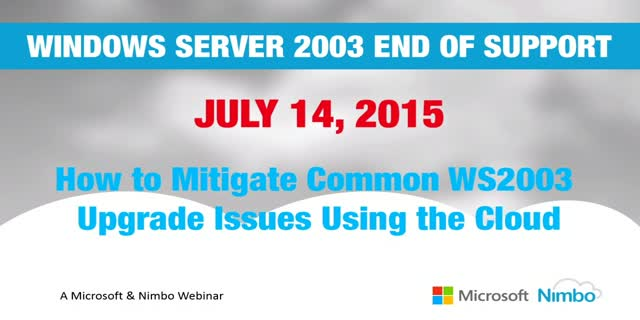 Microsoft has announced that Windows Server 2003 End of Support (EOS) is July 14, 2015. This means there'll be no patches or security updates, causing security and compliance issues that can put your applications and business at serious risk. Migrating away from Windows Server 2003 is an investment in your organization’s future, and there has never been a better time to begin planning your upgrade process. With many pitfalls, application mitigation options and technologies available, transforming your data center can appear to be an overwhelming task. - Learn how upgrading your WS2003 environment, using the Cloud, can help minimize the usual upgrade pains and make sure the transition to your new environment is smooth, compliant and compatible, with next to zero business distribution, decreased provisioning time and lower costs. Nimbo, an Inc. 500 company, provides Enterprise Cloud Solutions and migration services, helping enterprise organizations adopt and manage cloud technologies. Nimbo specializes in migrating line of business applications to the cloud, custom application development, integration and managed cloud services. By continually providing superior cloud solutions to satisfy business objectives, simplify IT management, meet security and compliance requirements, Nimbo is today a trusted partner to CIOs of some of the world’s largest organizations.